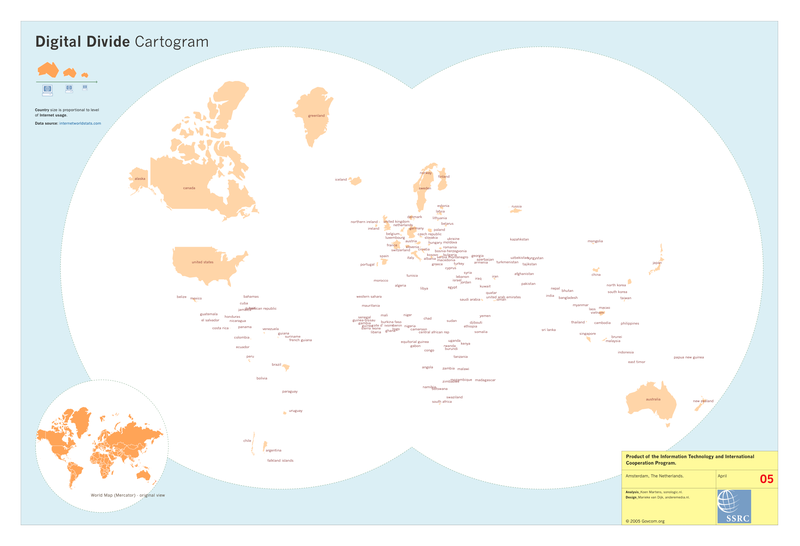 Thinking geographically with the Web may seem unusual at first. Geography is not thought to be arranged in the infrastructure of the Internet. An 'Internet geography' would not be in tune with the popular ideas of 'cyberspace' more generally (Chun, 2006). The protocols and principles, such as packet switching and the end-to-end principle, initially filled in the notion of cyberspace as a space or realm free from physical constraints. The Internets technical indifference to the geographical location of its users and their content spawned ideas not only of place-less-ness but also of equality, freedom and identity play. Significantly, the architecture supposedly made for a space untethered from the nation-states, and their divergent ways of treating flows of information. One recalls the famous quotation attributed to John Gilmore, co-founder with John Perry Barlow of the Electronic Frontier Foundation. "The Internet treats censorship as a malfunction, and routes around it" (Boyle, 1997). Cyberspace has since been grounded. Looking back at the locations of the original 13 root servers as well as the distributions of traffic flows by country, one could argue that the Internet has had specific geographies (and a topology of power) built into its infrastructure all along. However, it was the famous Yahoo! Nazi memorabilia lawsuit, and the subsequent technological developments stemming from proposals to block French users from the memorabilia page that brought the symbolic end to cyberspace as location-free (Goldsmith & Wu, 2006). Nowadays, major Websites (and advertisers) often serve content customized to the location of the user. One could argue that with the advent of widespread usage of geoIP, or IP address location technology, there emerges a series of 'Webs,' increasingly organized along linguistic and national lines. Figure One. 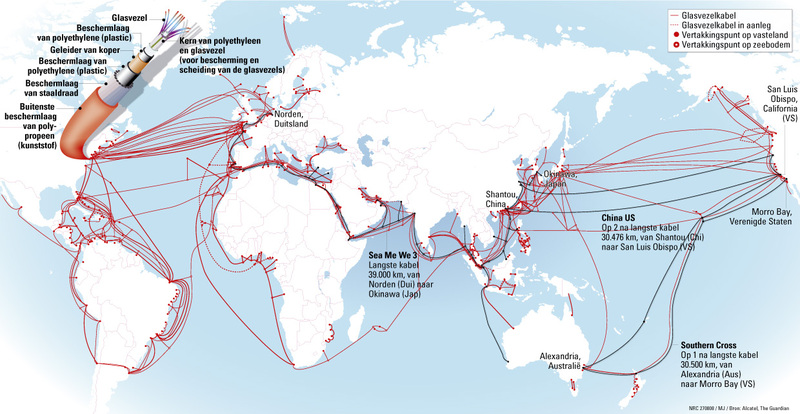 Fiber Optic World Infrastructure Map, Source: NRC.nl 2008. Apart from the realization of an infrastructural Internet topology and other 'cybergeographies' (Dodge and Kitchen, 2002), further efforts have been made to ground the Internet, most readily in the tradition of digital divide scholarship. Internet access is not equally distributed across the globe. (See Figure Two.) In exercises to deflate the great expectations surrounding the Internet (and debunk ideas of its social egalitarianism through technical infrastructure), digital divide scholars found many inequalities and 'cyberboles', including an unequal distribution of the skills necessary for use (Woolgar, 2002). The important work of the British Virtual Society? programme grounded the Internet, stripping it of its shine through the formulation of five rules of virtuality. The use of new media is based on one's situation (access issues), and the fears and risks are unequally divided (skills issues). With respect to the relationship between the real and the virtual, and the supposed separation of realms, rule three reads that virtual interactions supplement rather than substitute for the real, and four that virtual interactions stimulate more real interaction. Finally, in response to identity play, the research found that identities are grounded in both the online as well as the off-line. Figure Two. Digital Divide Cartogram, Govcom.org, 2005. Another way of thinking about the work of digital divide scholars as well as the virtual society? program is that, through its methods, it creates accounts of the online from the offline (Hine, 2005). Here we would like to return, in a way, to the inverse, but without the previously great expectations technologically afforded by the Internet. The aim is not to study the Web from the ground, but rather to introduce how accounts of society and culture may be 'digitally grounded.' What is the view of the ground from the Web? For example, certain countries have more .org's than .com's. Other countries make great use of 'mega-upload' sites rather than social networking sites. Is it thus feasible, and worthwhile, to gain indications of societal compositions and behaviors by studying the Web? If so, the accounts would be 'grounded' in the digital. Figure Three: Size of countries' domains according to Google Web Search. Figure Four: Size of countries' domains according to Google Region Search. Boyle, James (1997). "Foucault in Cyberspace: Surveillance, Sovereignty, and Hardwired Censors." University of Cincinnati Law Review. 66: 177-205. Chun, Wendy (2006). Control and Freedom: Power and Paranoia in the Age of Fiber Optics. Cambridge, MA: MIT Press. Cox, Kenneth C., Eick, Stephen G. and He, Taosong (1996). "3D Geographic Network Display," Sigmod Record. 25(4): 50-54. Dodge, Martin and Kitchin, Rob (2001). Atlas of Cyberspace. London: Addison Wesley. Goldsmith, Jack and Wu, Tim (2006). Who Controls the Internet? Illusions of a Borderless World. Oxford: OUP. Hine, Christine (ed.) (2005). Virtual Methods. Oxford: Berg. Woolgar, Steve (2002). "Five Rules of Virtuality." In: Woolgar, Steve (ed.) Virtual Society?  Technology, Cyberbole, Reality. Oxford: OUP, 1-22. How to demarcate a national web? The methods employ locative technical elements, i.e., a country's assigned top-level domain name (TLD), a country's IP-range (available from the five Regional Internet Registries: AfriNIC, APNIC, ARIN, LACNIC, RIPE ), as well as site registration information (whois records). 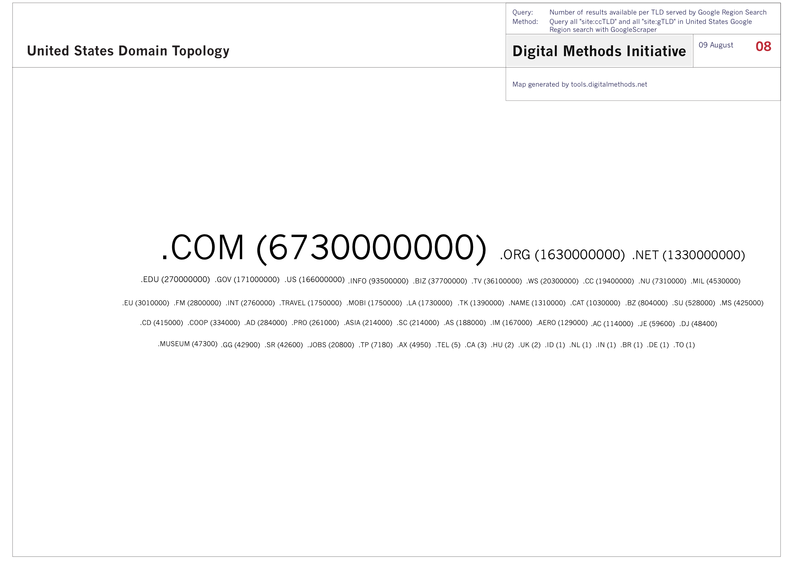 The tool, generatenational.net, provides a national Web by search Google for top-level as well as second-level country domains. It also provides the results for a region search based on the country chosen. National webs are also provided by Alexa.com in the form of country traffic statistics. 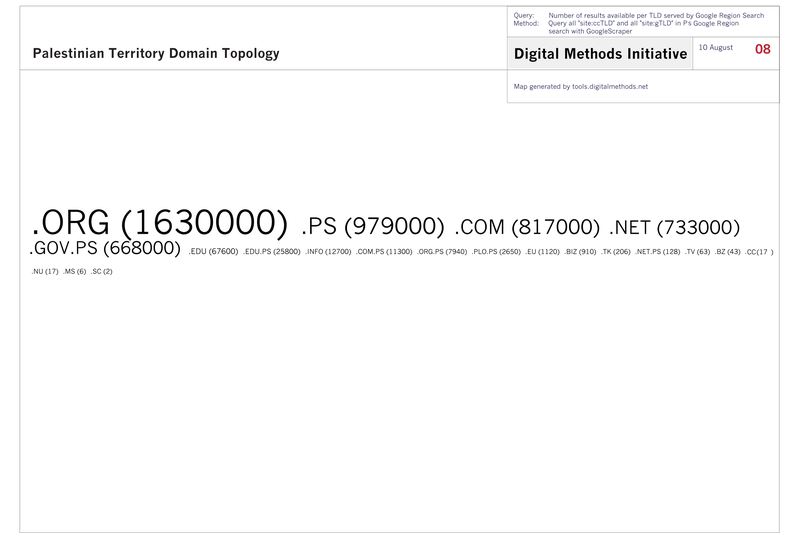 How to compare the domain topology for two national web spaces? Countries and geographical regions have assigned country code top level domains (ccTLD), delegated by IANA. Each nationally delegated authority (often referred to as country NICs) governs the country's domain and has its own policy for second-level domains, e.g., ac.uk. Generatenational.net is a tool that queries and fetches Google.com for ccTLD and SLD,* as well as Google Region Search for gTLD and ccTLD. Add the TLDs of choice formatted like e.g. "site:.com" under "Enter key words, one per line". Under "Options", set "Number of results per query (max 1000)" to 1 and name file. Under "Advanced options", set "Google Local version" to local domain of choice, and "region" to the region belonging to the local domain. Open http://tools.issuecrawler.net/beta/svgcloud/, fill in title, method and query. Copy and paste the TLDs with number between brackets in the field. Select "Cloud to svg/pdf". Repeat steps 1 to 4 for a .us (United States web) and compare results. Optional: The svg files may be edited in Adobe Illustrator. * SLD list is not exhaustive. Comparing the topology of the Palestinian web with the United States web. Under "Advanced options", set "Google Local version" to .ps, and "region" to Palestinian Territories. When comparing the two tag clouds, note that over half of the U.S. web pages is commercial, whilst the top Palestinian page type is .org. Compare the lists of top sites across two or more countries. Which sites appear across multiple country spaces? Which sites are specific to a country, and where do they appear? Potential projects include looking at the similarities and differences in site visitation for all former Soviet as well as East bloc countries, for all former colonies of a particular country, for countries in a conflict or at war, or empirically studying the notion of 'language webs.' '"International Relations" on the web' is an excellent example of a project that uses the Alexa country data. The project is done by our Parisian colleague Matthieu Renault from Tic Migrations. The graph shows countries clustered by their shared top visited sites.